… an accidental case of perfect timing. As the death knell sounds for the final issue of Britain’s biggest-selling newspaper The News of The World today, this newspaper manicure couldn’t have come at a more appropriate time. China Glaze Pelican Gray provided the foundation for this one. 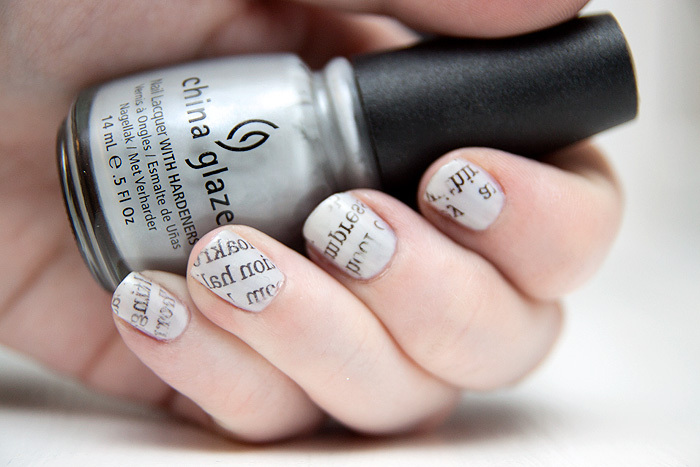 You can watch a tutorial on Newspaper nails below from Cutepolish, they’re SO easy! Not a huge fan of nail art as a rule, but I have to say I do quite like this! Think my problem is nail art is best on large nails and mine are stupidly small so not enough room to get enough pattern for it to make sense! Your timing is spot on! I need to try this! Really love it! love it! Very Parisienne feel. I love how this looks, might have to try this! I think I need to give this a go! Love love LOVE the effect! They look amazing! And that tutorial was so simple and quick! I just bought a grey polish recently so will definitely be copying this look. Where can you get rubbing alcohol? I went in every local chemist looking for it when I wanted to press a broken eyeshadow, I think they thought I was a desperate alcoholic or something. They’re so cool! Am I right thinking rubbing alcohol is the same as surgical spirit? I believe Surgical Spirit is what we call it over here – you should be able to find it in Boots and other pharmacies! This looks so good! I’d try this right now, but my nails have been breaking and flaking lately so they’re tiny stubs at the moment! Was it as easy as the tutorial makes it out to be?? I love this, I’ll definitely give it a try at some point. When I saw the picture I thought it must be really hard to do, so it was awesome to see that it’s actually simple! Brilliant & novel (haha) idea! wow i love this nail design its fantastic . Aaah! I just saw something like this but it involved actual paper being painted onto the nails. This seems much easier – I really like it! When I saw this I just had to have it. I tried it and it worked! (http://lockerz.com/s/120794245) It wasn’t without trial and error. Don’t let that alcohol dry up on your nail or the paper will stick. loved loved loved this manicure. perfect. That looks amazing!! I will have to try it one day. I am so late to this party but an easier way of transferring the ink (rather than dunking nails into the alcohol) is to place the newspaper onto the nail, then press a cotton ball soaked with alcohol on top, hold for a couple seconds, then remove the cotton ball and peel off newspaper. It works so much better. I’ve had zero transfer issues since switching to this method.